Share the post "What’s in Season from the Garden State: Legendary Jersey Tomatoes and the Role NJ Farmers Played in Selecting Winners"
Lyman Schermerhorn (left), breeder of the Rutgers tomato, in a field of tomatoes. Circa 1930s. Alumni Note: Rutgers’ work in tomato breeding was greatly influenced by the farm families growing test plants for the university. These families in turn were influenced by their connection to Rutgers. Read about Joe Musumeci’s (CAES ’67) journey from the family farm to Rutgers. Several of the classic Jersey tomato varieties that were grown on New Jersey farms in the mid-20th century were actually developed in New Jersey, with much of the tomato breeding done at Rutgers or at Campbell’s Soup Company research facility in Riverton, NJ. As the Rutgers New Jersey Agricultural Experiment Station (NJAES) grew in capacity to provide research and outreach to New Jersey farms, it acquired off-campus research farms to accommodate the extensive work done on testing and developing plant varieties for New Jersey farmers. 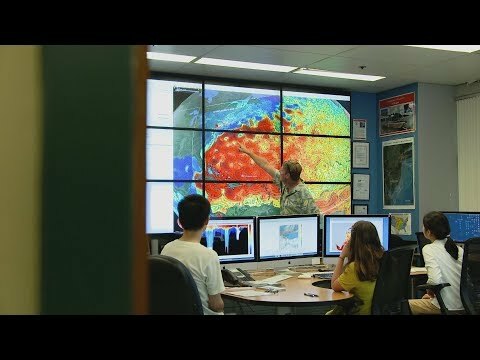 But before these research stations were established, a large portion of the trials was done right on New Jersey farms. As discussed in the previous installment of What’s in Season from the Garden State, not only did New Jersey farmers work closely with Rutgers researchers to test agricultural advances on their own farms, including new varieties of tomatoes that were bred at Rutgers, some of these farmer-university connections developed into more than just on-farm trials; they became enduring relationships. This is second part of the story of the farmer connections, with respect to the development of two legendary tomatoes from Rutgers. One of the early innovations with “global reach” that came from Rutgers NJAES was the development of the ‘Rutgers’ tomato. Released in 1934 by Rutgers plant breeder Lyman Schermerhorn, not only was Rutgers tomato a top performing variety for New Jersey’s canning and food processing industries like Campbell Soup, Heinz, Hunt, and P.J. 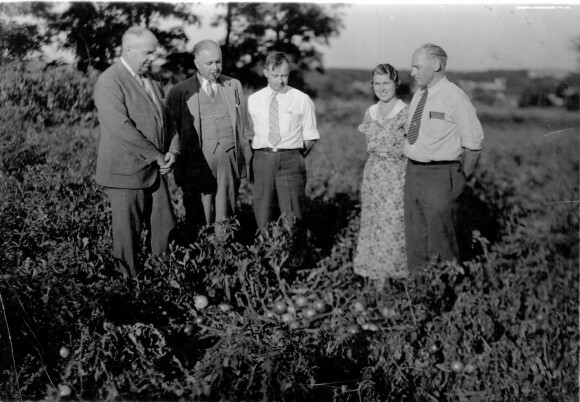 Ritter and Co., but Rutgers tomato continued to be a preferred choice of U.S. commercial tomato growers through much of the mid-twentieth century. It was grown worldwide and used in breeding and selection of other improved varieties. Before it was launched, the real testing ground for the Rutgers tomato was not the research trial plots at the university, but on New Jersey farms. From the original plants selected as most promising in the development of the Rutgers tomato in 1933, about 25 different selections were sent out for trial to a number of New Jersey tomato growers. In 1934 Schermerhorn reported that the four most promising selections were “sent out for more extensive trials to 75 farms in New Jersey scattered from Montague in Sussex County to Rio Grande in Cape May County.” One of the four test varieties was chosen as the top performer. That selection, tested and approved by New Jersey farmers, was released for general distribution in September 1934 as the “Rutgers tomato”. The Rutgers tomato wasn’t the only dynamo tomato developed at Rutgers. The late vegetable breeder Bernard Pollack, who passed away in July 2014, released the ‘Ramapo’ tomato in 1968. This delicious tasting and top performing tomato was embraced by home gardeners and commercial tomato growers alike. Where did much of the testing of this stellar tomato variety take place? On New Jersey farms. In South Jersey, the Ramapo tomato testing was part of the annual variety trials for tomato, pepper, and eggplant that were conducted on Joe Musumeci’s (then his father Frank’s) farm in Woolwich Township (Gloucester County) from the 1950’s until the early 1980’s, after which they were moved to the Rutgers Agricultural Research and Extension Center (RAREC) in Upper Deerfield. Musumeci recalls, “My father had a 3rd grade education – Mom made it through 5th grade – but was quite involved with the Gloucester County Board of Agriculture where he developed a close relationship with George Lamb, the Gloucester County Extension Agent. Dad died in 1970 but my brother Sam and I continued hosting the trials after that. Rutgers supplied and planted the plants, we would grow them and Rutgers grad students, breeders, and Extension agents would make frequent visits to evaluate the plots”. 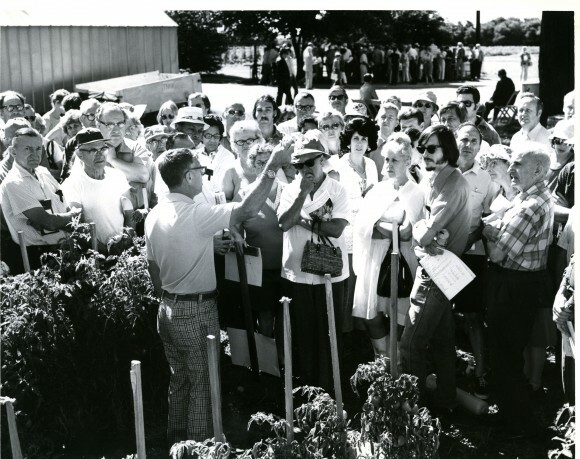 Bernard Pollack (center left) displaying tomato at Rutgers NJAES on-campus Open House in 1967. The Musumeci farm involvement sheds light on how farmers’ roles went beyond just providing land and labor to grow the research crops. As a high school student in the 1960s, Musumeci kept Pollack’s harvesting records. And where the rubber met the road for this farm family’s involvement was when they opened their farm for all to view the trial plots. “One evening each year we would host a ‘trials evaluation’ that would be attended by hundreds of growers, breeders, Extension agents, processors, and seedsmen from up and down the East Coast. I remember that event mainly because for about a week prior to it we had to clean up, mow, and move equipment so that there would be ample parking for the hundreds of cars and trucks”. When it came to the final determination for which varieties were winners, was it the researchers who made that call, or was it the farm families? Musumeci divulges, “As a grade school student I spent many hours weeding the plots and frequently was working in the trials when Bernie Pollack, Lyman Schermerhorn, and Extension Specialists Charlie Nissley and Brad Johnson would show up and ask me which varieties had the best tomatoes. I guess I must have been right some of the time because, when I reached high school age (1959) they figured it would be cheaper to have me harvest and evaluate the fruit than to send a grad student from New Brunswick to do it”. T he connection to Rutgers forged in Musumeci’s youth didn’t end there. Musumeci went on to attend the Rutgers College of Agriculture and Environmental Sciences (now School of Environmental and Biological Sciences), graduating in 1967. After RAREC opened in 1966, he sat on the steering committee until the late 1980’s, when he left production agriculture. 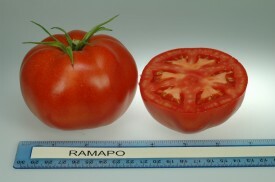 But in an interesting twist of fate, Musumeci’s connection to Rutgers and the Ramapo tomato was again resurrected in 2008. Musumeci’s company Eastern Seed Services, which operated in Salem County, provided seed treatment and processing services to buyers and vendors of seed. When Rutgers NJAES brought the Ramapo tomato back into commercial production after having been gone from the market for years, Rutgers handled Ramapo seed sales to home gardeners, but needed an independent company to handle the sale of bulk seed to commercial growers. Eastern Seed Services fulfilled that role until Musumeci’s retirement in 2013. As a young man who had a hand in the testing of the Ramapo tomato, it was only fitting that he later played a role in its distribution to a new crop of Jersey tomato growers, as well as growers across the U.S.
Today Rutgers NJAES researchers continue to work with New Jersey growers testing varieties and other ag innovations on New Jersey farms, but in a smaller capacity, as the preliminary work is now done on the NJAES research farms, however, another Rutgers tomato innovation may soon be trialed on New Jersey farms. 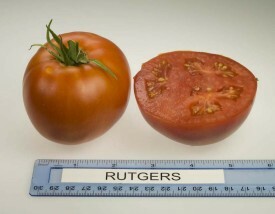 Tom Orton, vegetable breeding specialist and Pete Nitzsche, agricultural agent are developing a “retro” Rutgers tomato that is based on the original Rutgers tomato line which is long lost, since the seeds sold today are derivative selections, possibly even different cultivars, from the original. While the “retro” Rutgers tomato may appeal most to home gardeners, Jersey tomato growers will test this variety for potential home garden transplant sales, as well as direct market sales for farm markets. To get a taste of old time Jersey tomatoes and dozens of other tomato varieties, Rutgers Snyder Research Farm in Pittstown (Hunterdon County) hosts its annual Great Tomato Tasting in August.